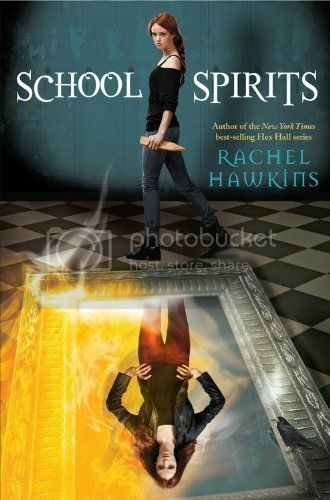 School Spirits is a spin-off novel from Rachel Hawkins’ Hex Hall series. I adored the Hex Hall series, and I was super excited to finally start School Spirits. I’ve had the book on my to-read list for quite some time, but I never had a chance to check it out. Then I discovered that my library had the audiobook for it, and I decided to give it a listen. I enjoyed it so much! The characters in the story are great. Izzy is related to Sophie from the Hex Hall series, and she was such a great character. She was determined and headstrong, and also very mature for her age. It was fun seeing her first real experience at high school, after being homeschooled all her life. Seeing the world that we saw in Hex Hall through Izzy’s eyes was definitely interesting, and I enjoyed the different point of view. The secondary characters are awesome as well. I really love Izzy’s mom, and also the new friends that she meets at her new school. They were all very interesting. But the most interesting is Torin, the warlock who was stuck in the mirror. I absolutely fascinated with Torin, and I’m dying to know more of his story! There was not as much magic and monsters in this book as there were in the Hex Hall series, but there was enough to keep me entertained. They storyline mainly revolved around one particular witch, which was awesome, as they are some of my most favorite paranormals to read about. Overall; I really enjoyed this spinoff novel! I am super curious to see if there’s going to be a sequel, as the end of the book was left to where there definitely could be one. I’d love to read it if there is! I'm kind of ashamed of myself. I loved the Hex Hall series too (I really need to reread! SOPHIE AND ARCHER!) but I haven't gotten around to his yet. I'm a little worried that the fact that she's 15 might put me off a little, so I'm glad to hear she's mature!